One of the main goals with our new collections website has been to create connections between the Cooper-Hewitt collection and the rest of the world that already exist out on the Internet. Wikipedia is a key part of that world, and Wikipedia is becoming more ‘museum-friendly‘ every day. Right now we know that we have 1,376 matches between people in our collection and Wikipedia. For each of these matches, visitors to our collection can find additional information directly from Wikipedia embedded in our site. But what about Wikipedia as a means for the public to discover our collection? In the month of January, the collections on our website received 4.75% of its traffic from Wikipedia. This was actually the largest source of traffic from other websites, with Twitter, Tumblr, Pinterest, Facebook and the Smithsonian’s main portal coming in slightly behind. We used an experimental Wikipedia Article Traffic Tool to look at number of page views for individual Wikipedia articles and for the top articles sending us traffic. Here are the top 5 pages from inside Wikipedia that sent us traffic in January compared to the amount of traffic each page received on Wikipedia itself. 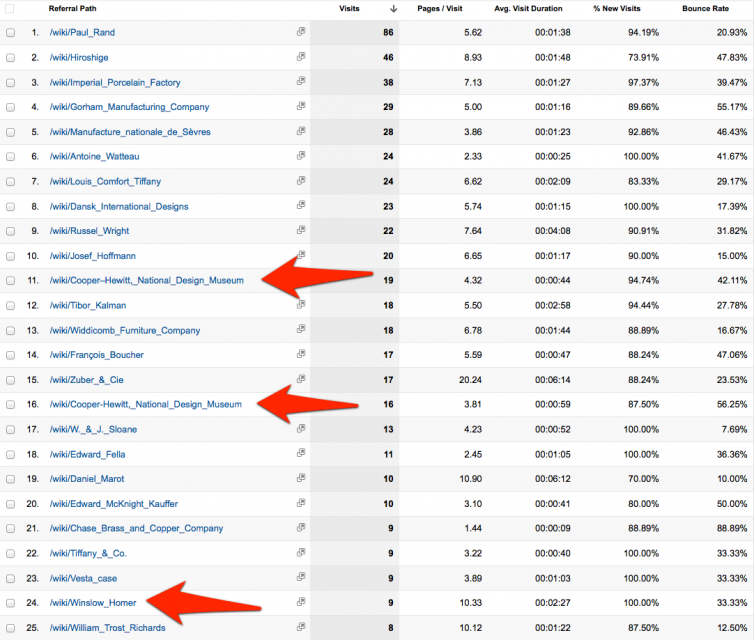 It’s a little interesting to note how some of the lesser known pages contributed a higher referral rate, and nearly as many total referrals as the second highest article. I sort of wonder if this has to do with the finer detail searching that someone might be doing, or the over-saturation of information on the bigger and more widely read Wikipedia entries. Looking at traffic from the top 25 Wikipedia articles that linked to us in January, I find it really interesting how some of our lesser known designers are more popular than some of the artists and designers that we have featured throughout our museum’s history. Not only that, but these designers are beating out the Wikipedia page for the museum itself! Not only that these visitors take a bit of a look around the site when they arrive. What I find really interesting about this sort of traffic is that it comes to us from a new point of view. People are exploring our collection in their own way, for their own ends. They aren’t necessarily starting (or even looking at) the things “we” think are most important. If you’d like to connect up some Wikipedia articles to objects or themes in our collection we’ve made it easy. At the bottom of each collection page there is a ‘Wikipedia citation template’ readymade for cutting and pasting. We were inspired to add this by the Powerhouse Museum and the National Library of Australia, both of whom also feature ‘easy Wikipedia citation templates’.